SOLANA BEACH — There was little disagreement among the six candidates running for three available City Council seats during an Oct. 6 forum moderated by the League of Women Voters. 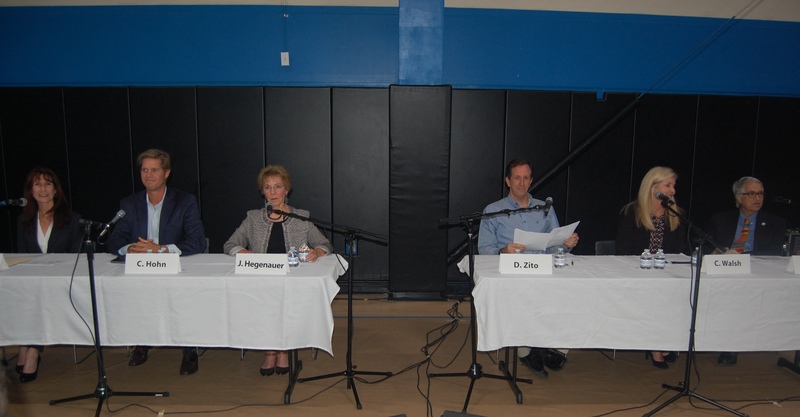 Answering questions submitted by some of the approximately 200 audience members, Mayor David Zito and residents Ed Siegel, Jewel Edson, Chris Hohn, Judy Hegenauer and Cynthia Walsh found common ground on nearly all issues except two. Hegenauer, Zito and Edson said they would not support a public vote for a Community Choice Aggregation program, something current council members have been working on for the past few years. Walsh said it should go to a vote, while Hohn and Siegel said they need more information before making a decision. CCAs allow cities to buy or generate alternative energy supplies while maintaining the existing power provider — in this case SDG&E — for transmission and distribution services. The goal is to provide a higher percentage of renewable energy at competitive and potentially cheaper rates while giving customers local choices and promoting the development of renewable power sources. The city is currently reviewing proposals from three companies it could potentially partner with to implement such a program. Critics say there are too many unanswered questions and there has been little public outreach and education. “We all want clean sustainable energy,” she said, adding that the final decision should be up to voters because it is such a complex issue. Zito said that’s why it shouldn’t be decided by voters. “I certainly support exploring the opportunity,” he said. “It does provide choice for power selection. … We definitely need to do our due diligence in exploring all of the various ramifications and very complex issues. “That’s one of the reasons I’d be a little bit nervous about putting it to a vote,” Zito added. “There are public vote items which are very clear.” CCAs are not one of them, he said. A review of the group’s activities indicated it was duplicative and taking up valuable staff time. Zito, Hegenauer and Edson said it should not be reinstated. It was redundant, Edson said. We have a good sheriff’s presence and they will ensure we are covered. The other three candidates disagreed. “Public safety should be our No. 1 priority,” Walsh said, adding that redundancy issues should be identified to make the group more effective. The candidates all agree the city is in good financial shape, protecting the shoreline and getting an approved Local Coastal Program should be top priorities and finding ways to increase parking would be the best way to support the business community. They also support promoting fine arts in the city, but Siegel took it one step further, saying he would like to see more children involved. The candidates said the city should find creative ways to increase the number of affordable housing units without negatively impacting the neighborhoods. “It’s important that there’s housing available for people who support our community, like teachers, firefighters and police officers, and for seniors and young adults,” Edson said, noting that granny flats and other types of housing could be used. “I plan to study this information because I think there are some great creative solutions out there,” she added. The candidates all said people running for public office in Solana Beach should not accept donations from developers who have projects in the city. Zito said when he ran for his first term in 2012 he received such a donation but returned it. Everyone supports the existing regulations for short-term rentals. Hohn said that while believes neighborhoods need to be protected, especially if there are frequent turnovers, he would have a hard time telling people what they can do with their homes. The candidates all favor providing incentives to private property owners to possibly keep them from cutting down large trees that are important to other residents. “Of course we all love beautiful old tees but the bottom line is, it’s private property,” Walsh said. “I think it would be sad to see one of those beautiful large Torrey pine trees … go down but I would still be very hesitant to come up with some sort of city plan to stop somebody from maintaining their own property,” Hohn said. The candidates were asked to list their top priorities for the city should they be elected. Siegel said he would like to create a better sense of community by increasing the use of the city song and making City Hall less formal. She said she would also work on fiscal stability, protecting natural resources and advocating for safer streets, parkways, paths and neighborhoods for pedestrians, cyclists and strollers. Hohn said he would focus on clean and safe streets, maintaining and improving infrastructure and the environment and protecting the quality of life. Hegenauer said she would “keep a good eye on proposed developments” to ensure they “add to the feel of the community” and don’t negatively impact it. She said she would “make sure CCA is implemented” and increase walkability citywide. Walsh’s top priorities include creating a strong working relationship between citizens and City Council, addressing public safety concerns and supporting the business community. Zito, the only incumbent, said he will continue to focus on ensuing that basic city services run well and the city’s finances remain healthy. He would also work to secure funding for a 50-year sand replenishment project for shoreline protection and get an approval Local Coastal Program. Additionally, he would like to see a resident-serving compatible train station project completed in the next four years.